Braid Strap Mirror (Dove Grey, Cream & Platinum, with Pewtered Steel) by Genevieve Bennett draws inspiration from the simple geometry of braiding, twisting, weaving and binding. Braid Strap Mirror (Dove Grey, Cream & Platinum, with Pewtered Steel) by Genevieve Bennett has a luxurious wide frame suspended by a hand-woven leather strap which sits around the entire circumference of the piece. Premium mirror glass is set back within the frame, enhancing the subtle lustre of the metal. The piece is influenced by traditional leather-working techniques, referencing saddlery, bridlery, ribbon braiding as well as the heritage of wrought iron work. This piece is available in a range of colours, including Rose, Ink Grey, and Rose & Agave, all with a choice of brass or pewtered steel frames. Please contact The New Craftsmen for more information. Material: pewtered steel frame, leather decorative cord. Dimensions: Height: 6cm, Length: 75cm, Width: 75cm. Care Instructions: This product is fragile, handle with care, gloves are recommended. The leather is hand woven and hand stitched by Genevieve in her London studio. The colours are dyed to match her signature colour palette of ten beautiful hues. The brass frames are hand rolled and the strap is fitted around the frame and fixed using a stud detail. Genevieve Bennett is a London-based designer who creates distinctive pieces which stand the test of time. 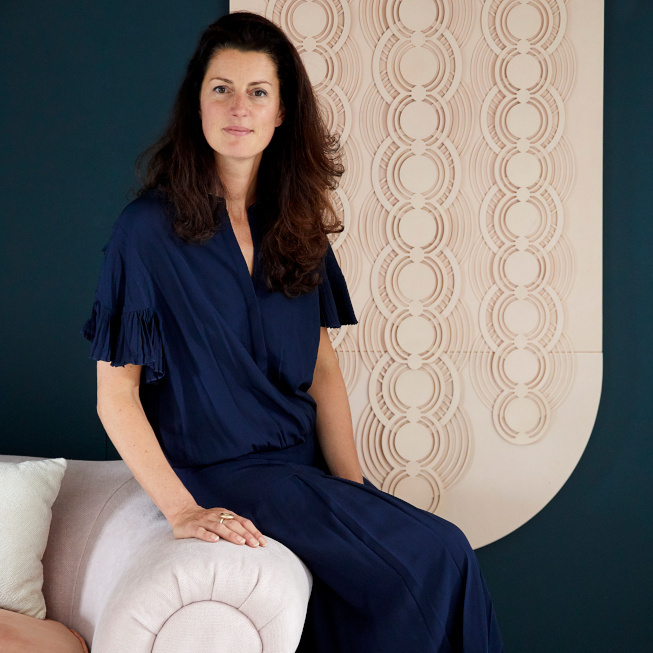 After being awarded a Masters in Printed and Embroidered Textiles from the Royal College of Art, Genevieve then worked as a consultant for brands such as Habitat and Wedgwood, before establishing her own bespoke leather studio. Drawing upon a range of influences, from 16th Century embossed leather wallcoverings to 17th Century wood carvings, each design references traditions yet are thoroughly contemporary in feel.